Working our way through the summer-July. Since I didn’t write anything about our summer, I thought I would get you all caught up. The last summer post was mid-July, and right after that, N and I left on an Alaskan cruise, an amazing opportunity provided by N’s job. During this week, the boys stayed with our neighbor and her kids in between our two houses. I will just say this before trying to describe it to you, If you get a chance to go to Alaska or on an Alaskan cruise, DO IT! <—— See those words, they are being said loudly and enthusiastically. GO! SEE! ALASKA! Get it? Got it? Good! Seriously! Do you get the feeling that I loved it?! Well you are one smart cookie 🙂 Yes, I did in fact love every view, every sound, every smell, and everything we were able to experience in our limited time on land. 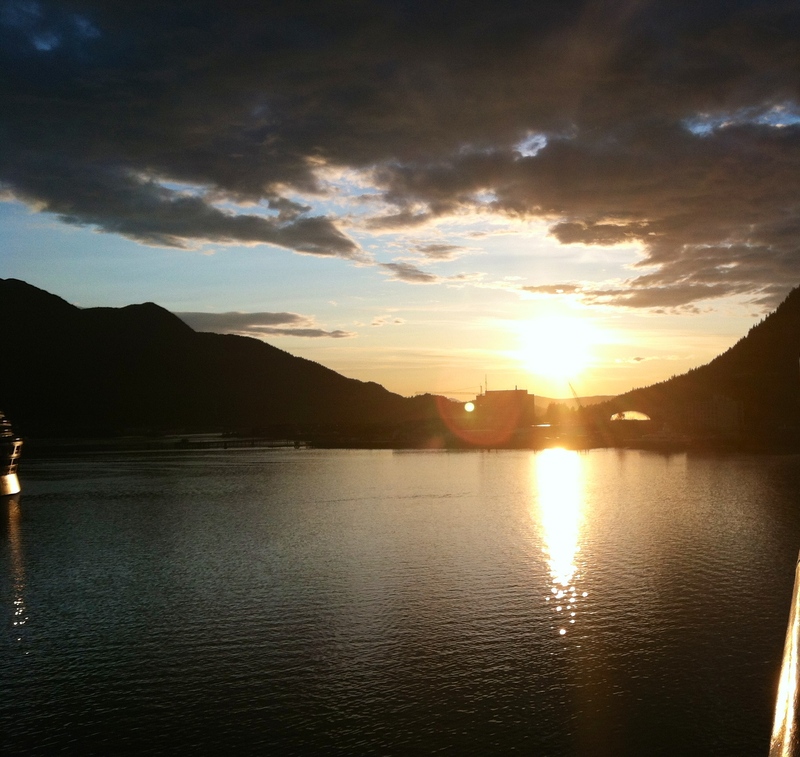 I fell in Love with Alaska! But I kinda knew I would. It’s the same way I love WA or MT, their beauty is breathtaking, indescribable, and it worms its way into your heart. Or maybe that’s just me. I won’t say much about the cruise because being on the ship wasn’t that exciting, except for the food. The food was delicious! Superbly so. But it’s not that I didn’t like being on the ship, but this wasn’t your typical cruise. It was taken over by a ministry and ran very differently. And while it was nice, there wasn’t a lot for me to do except go to the cooking shows everyday and one ventriloquist act that was so hilarious we bought the dvd. But the food was delicious! And seeing Alaska was divine! 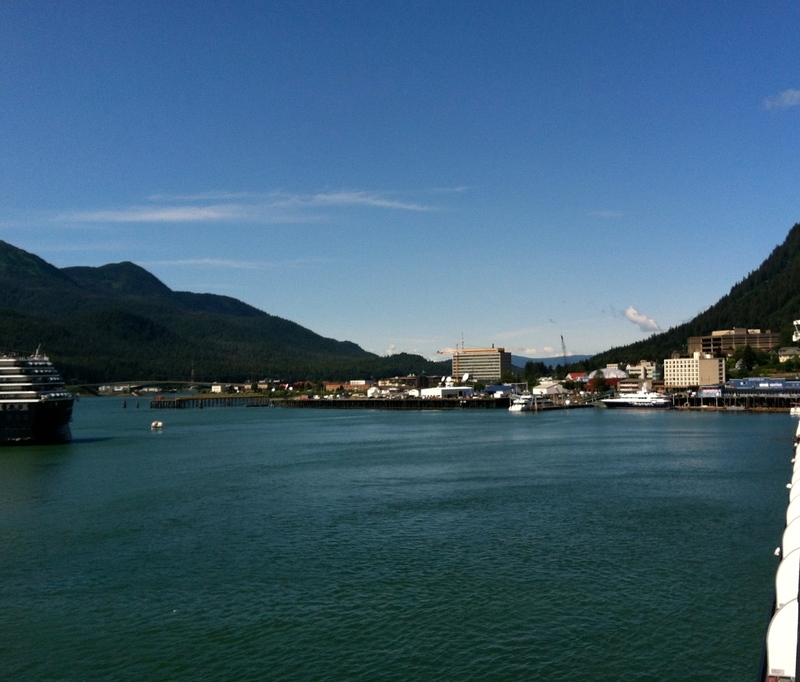 We went to Juneau, Sitka, and Ketchikan. I could spend hours describing AK’s beauty, but instead I will show you a few pictures instead. While it doesn’t look like much, you are seeing 22 miles of glacier. 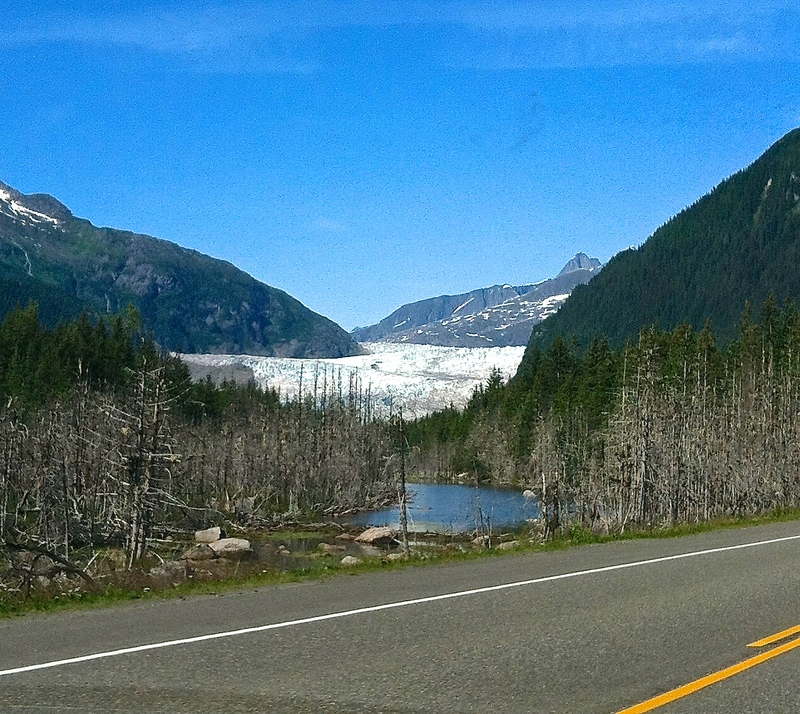 A view of Mendenhall Glacier from the road as we headed there. A view of Mendenhall Glacier from the trail. A female bald eagle. They were very abundant in Sitka, AK. N holding a piece of the Mendenhall Glacier. 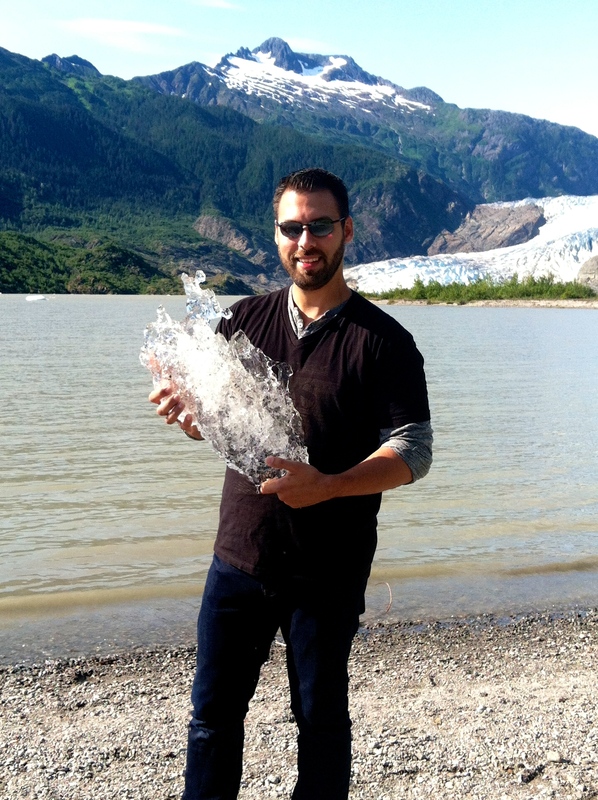 As you can tell, we went to see Mendenhall Glacier, which was in Juneau, our first stop. N and I enjoyed the short hike, going off the beaten path a bit. 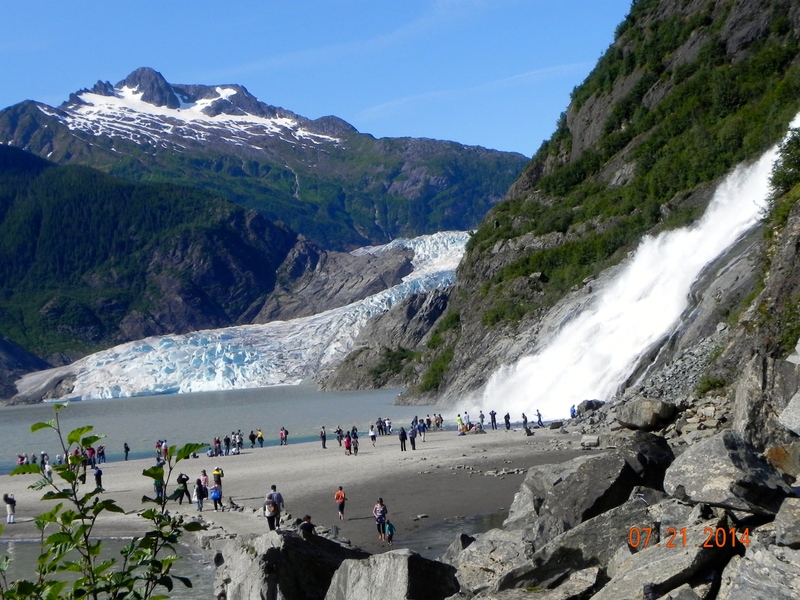 We stumbled across a family whose kids were in the water holding pieces of the glacier. We just had to get in on the fun and do it too. So we took off our socks, rolled up our pants, and stepped into the deliciously cold water to grab some ice. We have pictures of each of us standing in the water, but the one above turned out better. I also stood in the water near the waterfall at this glacier too. Brrrrrr. It was refreshing, cold, and not something you want to do for too long. 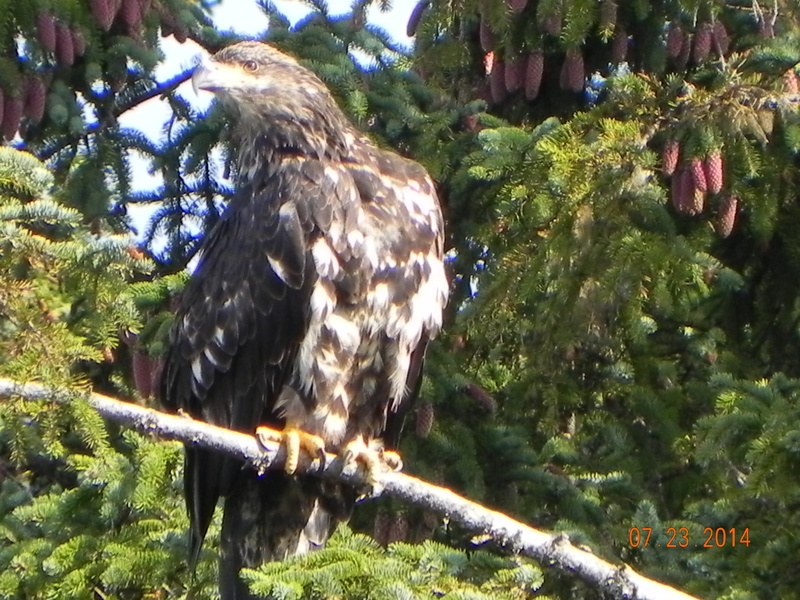 The bald eagle picture is from Sitka, where we saw so very many of them. One flew so low near us that we heard the wings flapping. In Sitka, we went to a park and really got to see lots of wildlife, so most of the pics from there are of animals and plants. Ketchikan was super touristy, and we weren’t there long enough to go to the outskirts and do what was offered there. We did see orca whales on the trip, and even a humpback, though only it’s back. In Glacier Bay, we saw lots of spouting from the whales and sea otters. 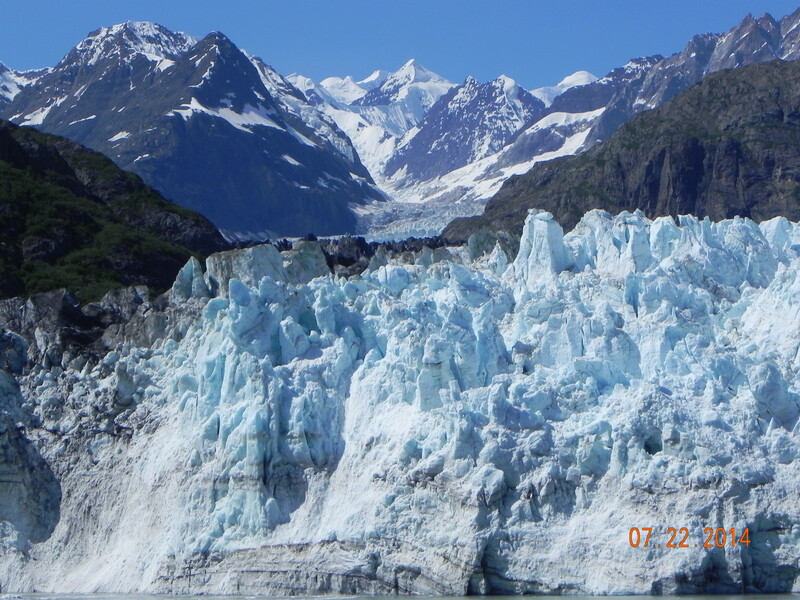 We also enjoyed watching the Margerie Glacier calve. It was incredible to hear, so very loud-sounding. I was able to capture quite a few pictures of it as there was a lot of activity. 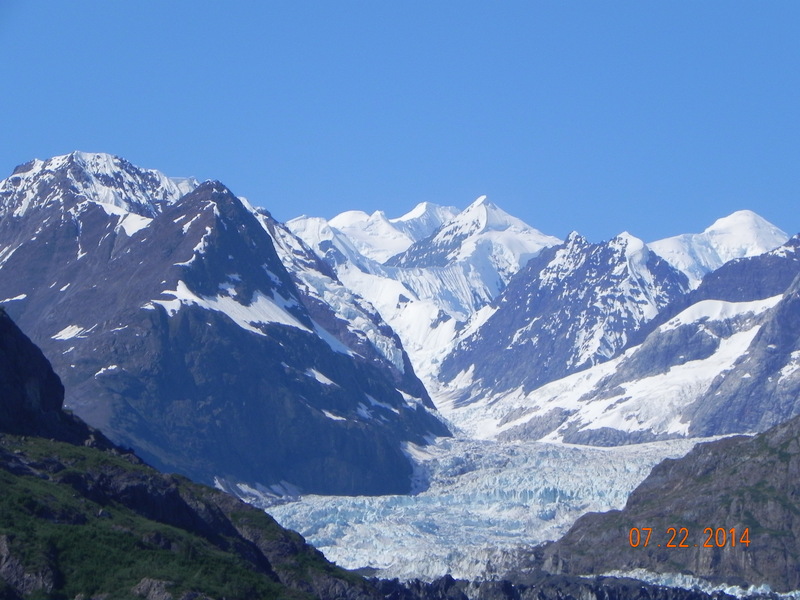 I was told from a woman who worked with the rangers, that it was very rare to have such a clear blue day where all the mountain tops were visible, hence the pic of the glacier 22 miles long. Apparently even on sunny days, there is usually a fog around the peaks preventing them from being visible. I hope you enjoyed the pictures. I have hundreds of them, so I just showed a few that I thought others would find interesting. I, of course, love all of them. And I do want to go back again, and hope I am able to. 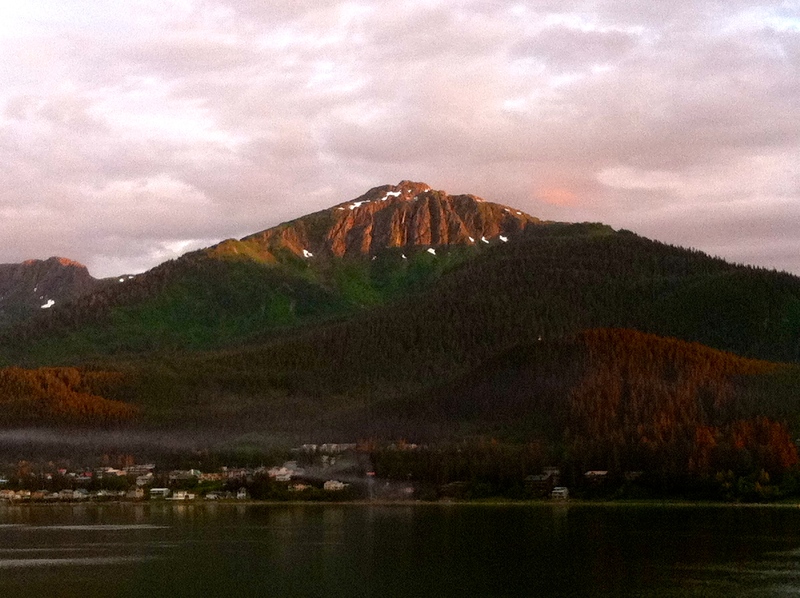 But if not, I am so very thankful that I got a chance to catch just a small glimpse of the beauty Alaska has to offer.